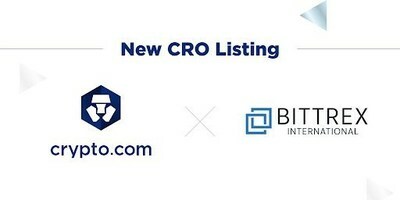 Crypto.com, the pioneering payments and cryptocurrency platform, today announced that its Crypto.com Chain Token (CRO) has been listed on Bittrex International, an international exchange by a premier U.S.-based blockchain trading platform Bittrex. Kris Marszalek, Co-Founder and CEO of Crypto.com said, "The Crypto.com Pay SDK has shipped and we will open the platform to our 400,000 users next week. The CRO token serves as a cross-currency settlement instrument for our native blockchain. Further listings of the token will increase liquidity necessary to support transaction volumes and settlement for our growing list of merchants."